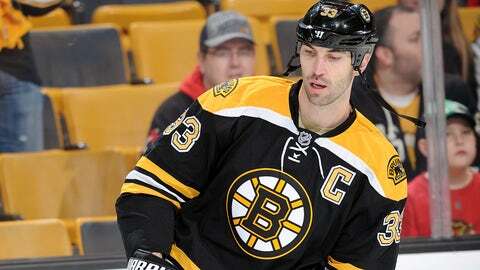 Could Bruins' captain Zdeno Chara be on the trade block? It took just two games for trade rumors to make the rounds in Boston, and those rumors are big ones. According to a report from CSN New England's Joe Haggerty, the Bruins are discussing the possibility of trading veterans Zdeno Chara and Brad Marchand. This report is surprising both because of the big names involved as well as the fact that both players are currently battling injuries. The 38-year-old Chara missed the first two games of the season with an upper-body injury while Marchand is out indefinitely with a concussion. The team's start to the season has gone just as poorly as fans feared, as the Bruins allowed 10 goals against in two games, tying them with the Philadelphia Flyers for the worst goals-against through two games in the league. If the Bruins do decide to trade Chara or Marchand, it could be a sign that the team is shifting its focus to the future rather than looking to win now. Of course these rumors are still very premature. Discussions about trades are hardly real negotiations, and it would be strange to see a lot of interest for an injured player at this stage of the season, but it is definitely something for Bruins fans to keep an eye on.